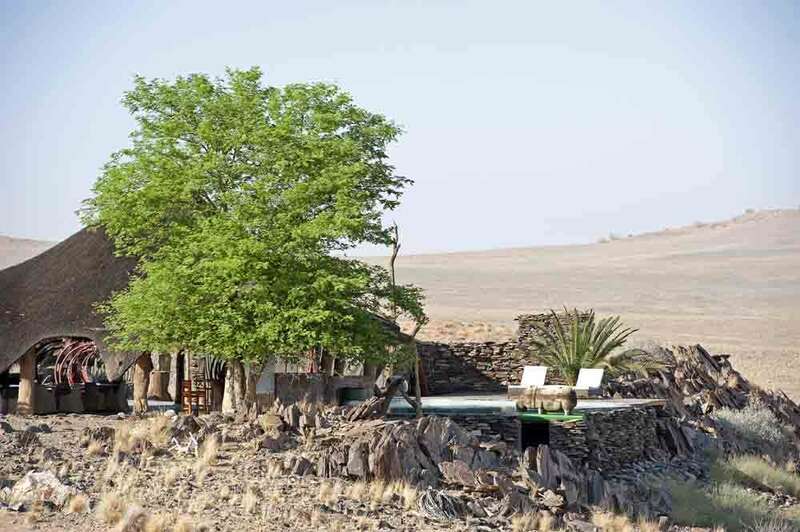 Every new day in Namibia is different from the last – as are the places you’ll stay. 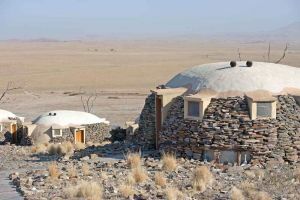 Compared with Botswana, whose luxury tented accommodation is outstanding but somewhat formulaic, Namibia doesn’t quite have the edge on luxury but certainly presents the traveller with a variety we’ve not found elsewhere. 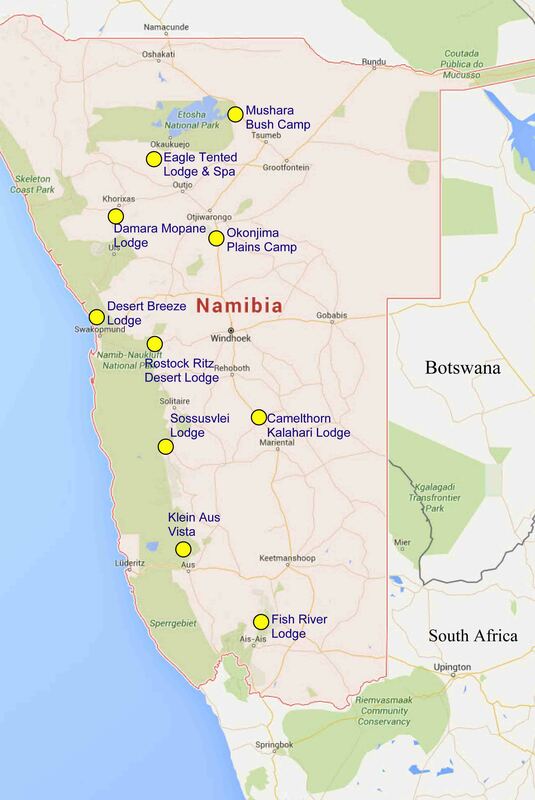 Similarly, whereas Botswana is primarily a wildlife destination, Namibia is an adventure experience. 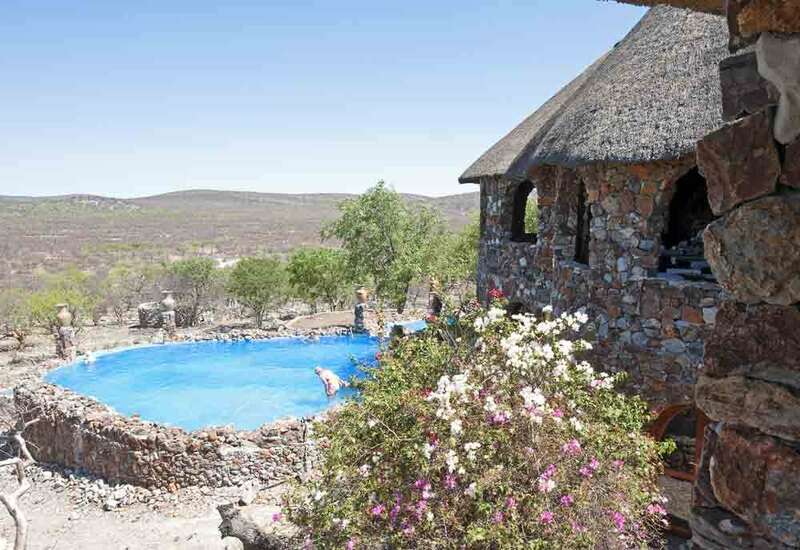 As the landscape changes in Namibia so do the lodges, often reflecting the landscape or traditions within the area. With its colonial influences from Germany and South Africa, as well as the more traditional San and Himba bush people’s style of building you’ll thoroughly enjoy the variety and architecture of accommodation you’ll visit; together with an almost faultless hospitality that eclipses any minor shortfalls you might encounter. Whereas in most ‘luxury’ hotels and lodges in more extensively developed tourist locations on the planet there is an almost standard menu of facilities and resources available to the luxury traveller, in Namibia the locations seem to make their own selection from the menu – so you’ll have a hair dryer in one lodge but not another, mains adapters supplied in one but not another, afternoon tea and cakes in one safari lodge but omitted from another. This lack of consistency isn’t a problem but worth making note of if there are certain ‘must haves’ in your packing list. As a general rule, Wi-Fi is available throughout within the central reception areas but not necessarily within individual rooms. 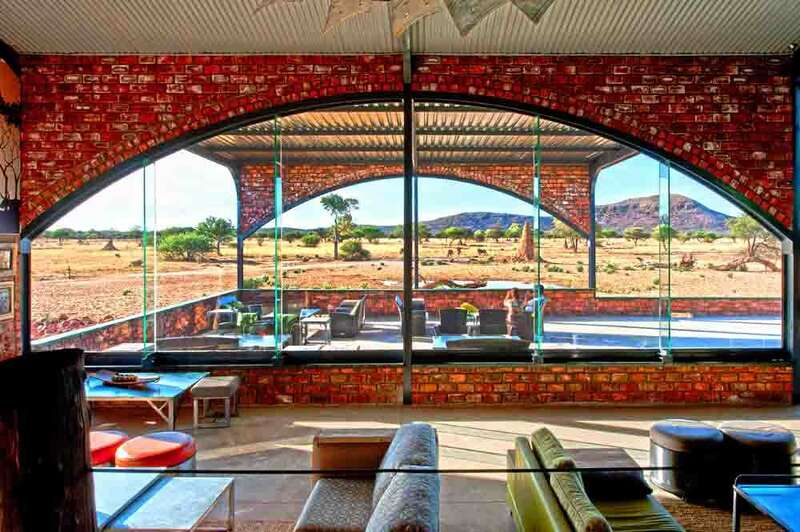 In our opinion Namibia benefits from this individual approach to luxury travel in that we never knew what to expect in terms of style, cuisine, facilities or location but were never disappointed with any of them. These are a selection of the places we stayed. 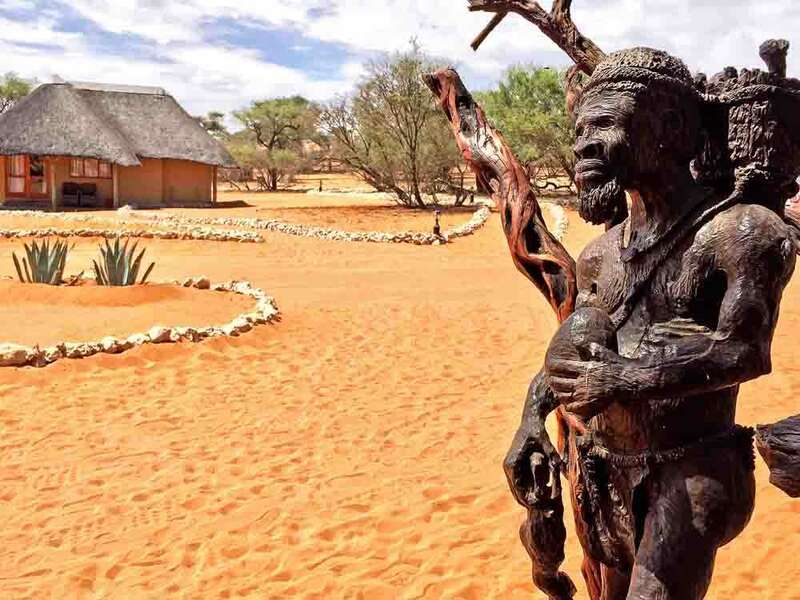 Namibia provides the traveller with an experience that doesn’t feel as though it’s just been replicated from other countries – a truly unique journey. We hope you’ll like some of our recommends if you venture out there. 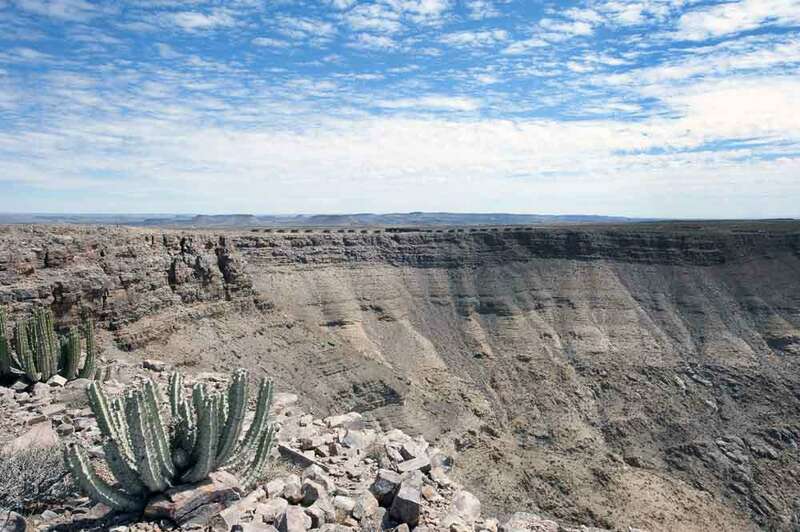 We’ve dealt with these by listing them in a clockwise direction as we travelled from Windhoek – which starts at 3 o’clock on the map of Namibia. We’ve given just a brief personal overview of each but included the urls for your own benefit should you choose to learn more. 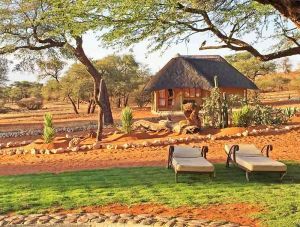 Camelthorn is nestled in the cool woodlands on the Southern edge of the famous Ngamo Plains of the Kalahari Desert. 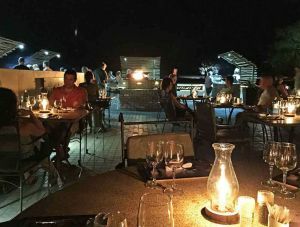 The camp revolves around a central lodge that offers a bar, elevated dining area and plunge pool where everyone congregates at some time during the day. 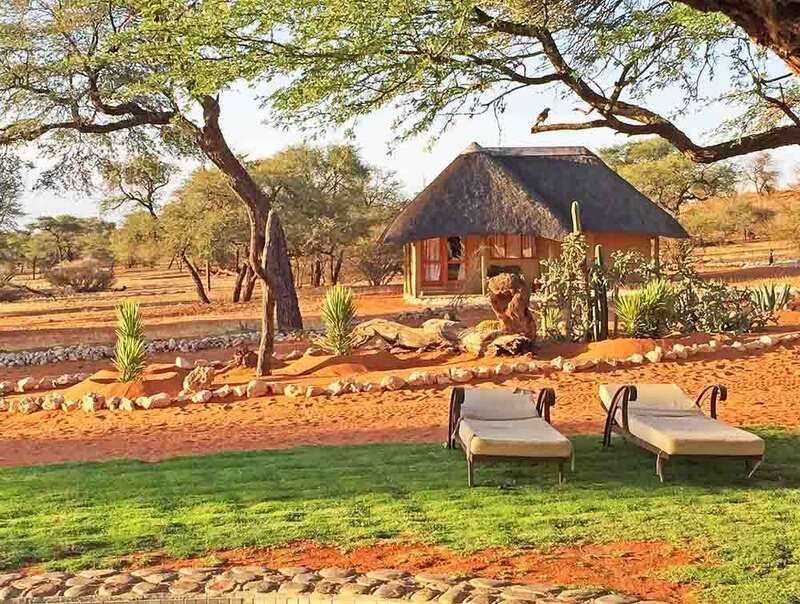 Accommodation is in charming individual thatched bungalows, or villas, each of which are only a short stroll from the lodge across the red sands of the Kalahari. 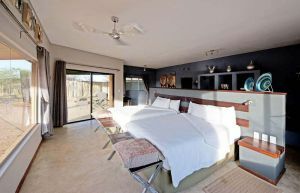 Each villa is self-contained with en suite facilities, large windows and decking outside from which to view the Kalahari bush. Wildlife wanders past the camp, occasionally stopping for a drink at the nearby waterhole – or from the plunge pool!. 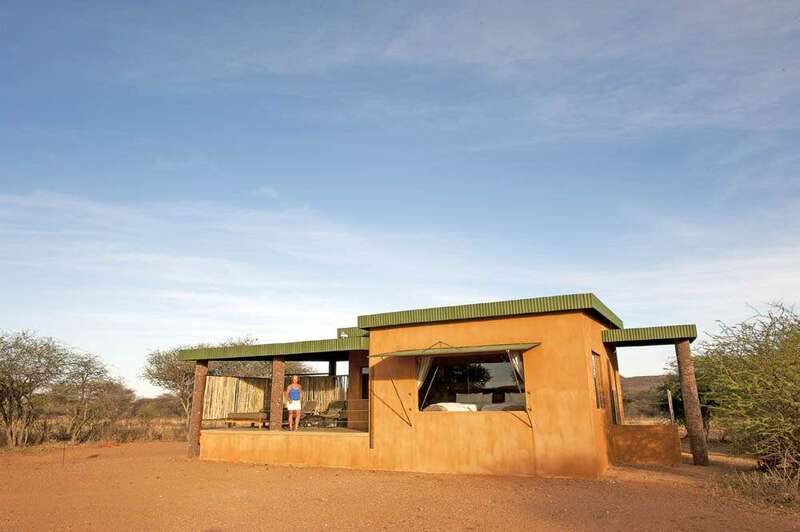 As the camp is within a private reserve the safari experience is somewhat limited but enjoyable nonetheless and your stay here should be part of an overall desert experience rather than as a pure wildlife destination. Al fresco dining, open fires, sundowners and tasty meals all complement the overall impression of a relaxing place to stay. 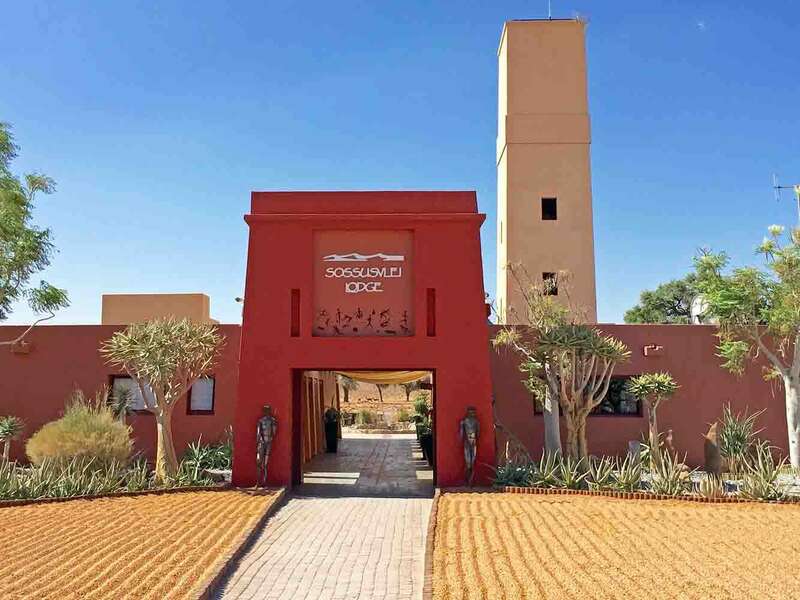 Zebra and Suricate Lodges also share this private reserve but Zebra caters for up to eighty people and Suricate is more basic in appointment. 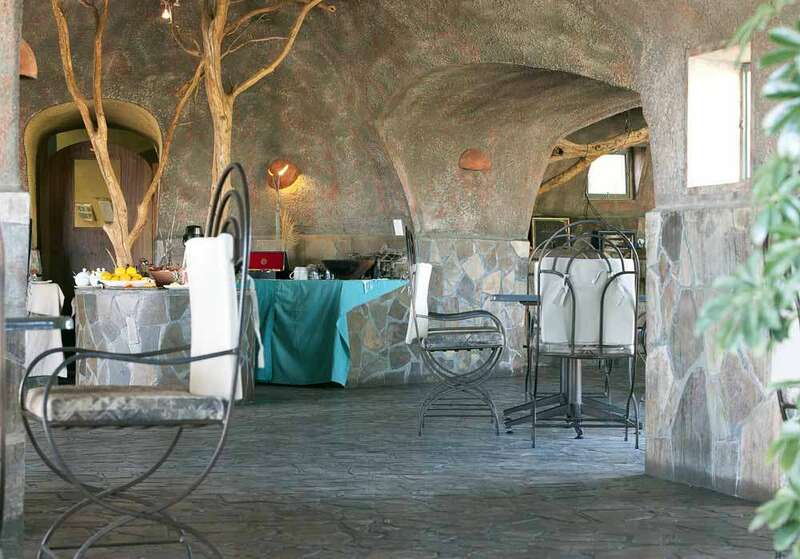 No matter how jaded you might be by the journey across broken rocky roads, on arrival at Fish River Lodge you’ll be bowled over by the stunning vista as you walk through the entrance door. Fish River Lodge in southern Namibia is the only lodge perched directly on the rim of the Fish River Canyon offering guests breath-taking views of the canyon from sunrise to sunset. 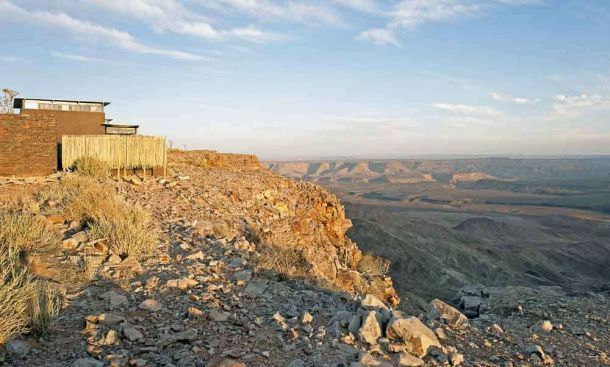 Whilst the architecture of Fish River Lodge is quite brutalist it’s also exceedingly clever in that (when seen from further around the rim) it mirrors the harsh rock strata, exposed over 300 million years ago, when the Fish River began to etch its way through hard quartzite forming a Canyon 90 kilometres long, 549 metres deep and 28 kilometres wide in some places; making it the world’s second largest Canyon. 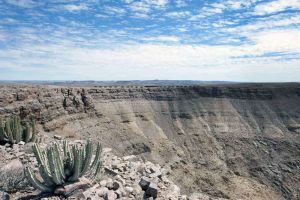 Whilst there are several ways to explore the canyon, we were more than happy to take a well-earned break from driving by taking a relatively easy one hour stroll around the rim to a viewpoint before returning to relax by the pool that perches on the edge of the canyon. 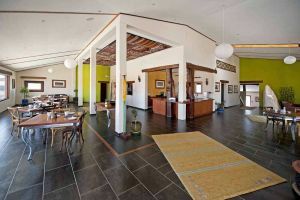 A small collection of about twenty individual and spacious accommodation units are smartly appointed and reflect the angular and uncompromising architecture of the main building, which serves as bar, reception and dining area. 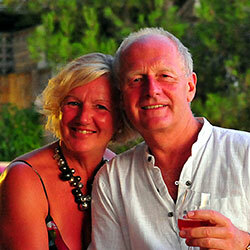 Dinner is a set menu each evening but thoroughly enjoyable, whilst staff are ever helpful and courteous. Fish River Lodge is an experience not to be missed. Crossing the narrow gauge mining railway to reach Klein Aus vista we could have been forgiven for thinking that we’d entered a smaller version of the American Klondike. 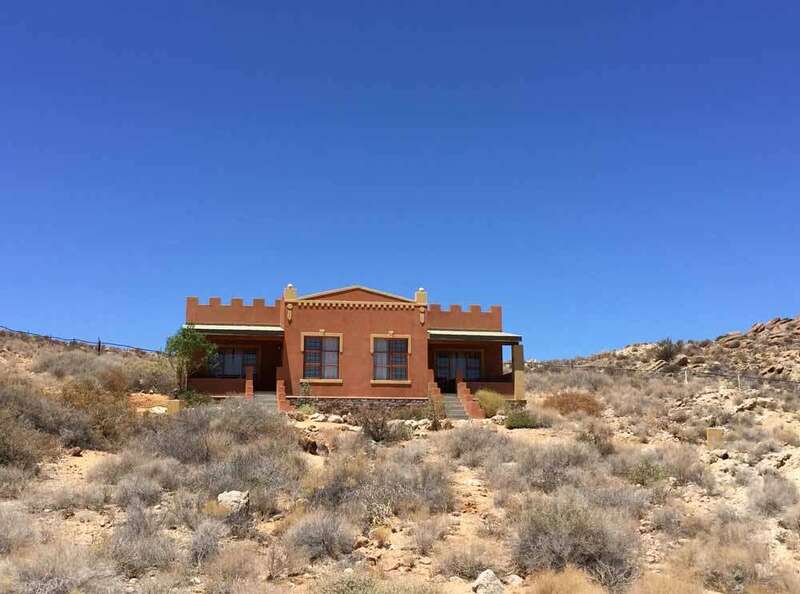 The dozen or so self-contained stone built semi-detached chalets dotted around the rocky hillside but within easy reach of the main bar/dining/reception complex ‘The Desert Horse Inn’ made us feel as though we’d ventured into a Disney film set. We questioned why we had decided to stay here as this type of community is not our first choice for accommodation but the place is ideally situated if you have any intention of visiting the wild Garub horses of the Namib Desert and want to break the journey to Luderitz –another 110kms further on. 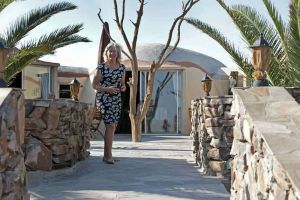 Despite our reservations the rooms were clean; the staff very pleasant, albeit reception staff seemed unnecessarily permanently under pressure; buffet meals were hearty with a Germanic leaning and every chalet had a veranda on which to while away a few minutes as the sun set over the Namib Desert. Despite our initial reservations we came away with a positive impression of Klein Aus Vista and it certainly falls into the category of ‘unusual’ for the purposes of this post. Situated just outside the Entrance Gate to the Namib Naukluft Park, Sossusvlei Lodge offers direct access to the towering red sand dunes, the famous pan of Sossusvlei, the scorched black trees of Dead Vlei and the Sesriem Canyon. 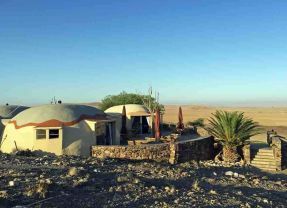 Again our initial impression was one of entering a holiday park but this was quickly dispelled as we were shown to our own individual lodge that’s an amalgam of dwarf adobe walls and canvas – forming a quasi-luxury tent with walls! 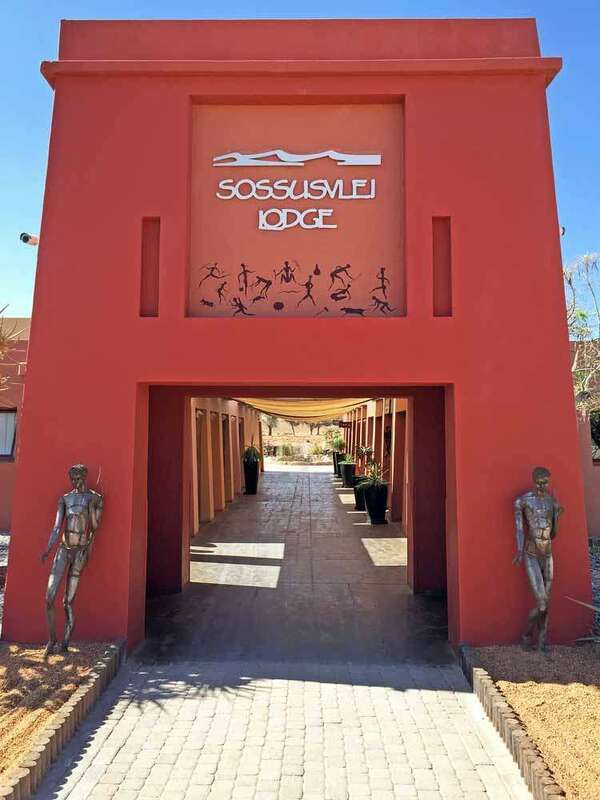 The 45 individual luxurious accommodation units at Sossusvlei Lodge are carefully laid out and do seem to blend in with the magnificent surrounding natural environment. 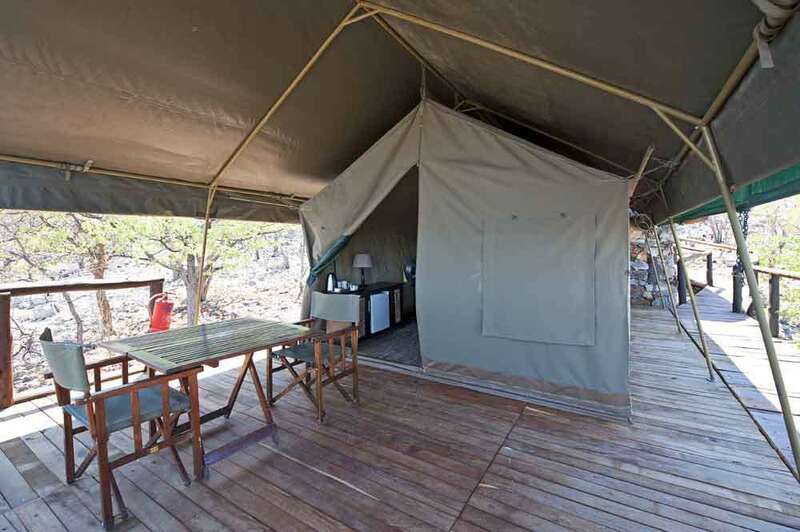 Each fully air-conditioned unit has a patio, en-suite bathroom with shower and a spacious bedroom under canvas. 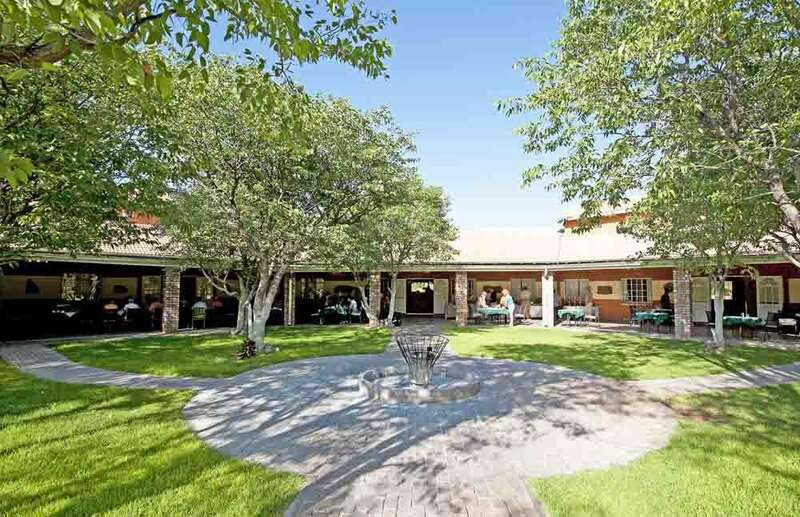 The site is extensive so you may need to walk for five or so minutes to reach the central area where dining, swimming and reception are located. Facilities include a sensible pool, bar, beer garden and an al fresco terrace where one can enjoy a comprehensive variety of buffet food (including, if you wish, freshly barbecued bush meat), award-winning wines and views of the floodlit waterhole. Staff are attentive and friendly and our only criticism would be that, in our perception, sheer weight of visitor numbers undermines the chance of truly personal service attitudes. 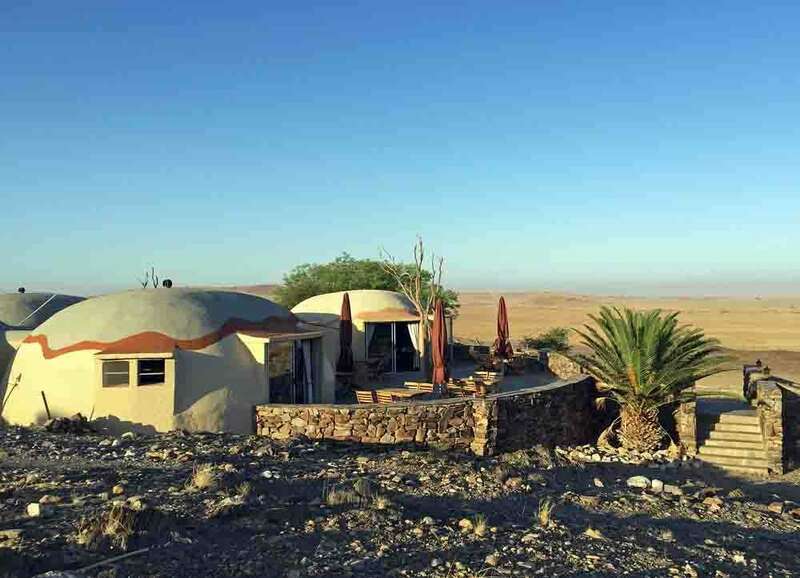 The improbably named Rostock Ritz is a collection of rock ‘igloos’ nestled on the side of a barren hill on the edge of the desolate Namib desert. After a five minute drive from the main gravel road we approached a scattered collection of buildings whose initially disappointing appearance is more reminiscent of an industrial utility yard than a luxury lodge as the parking area and service areas are more evident and bisect the main facilities. As you can guess, the owner Wolfgang didn’t write the last two sentences as it wouldn’t attract anyone and the whole place not only belies initial impressions but is a testament to his personal vision and drive to establish what is a truly unique experience within Namibia; literally carved from the surrounding rock. 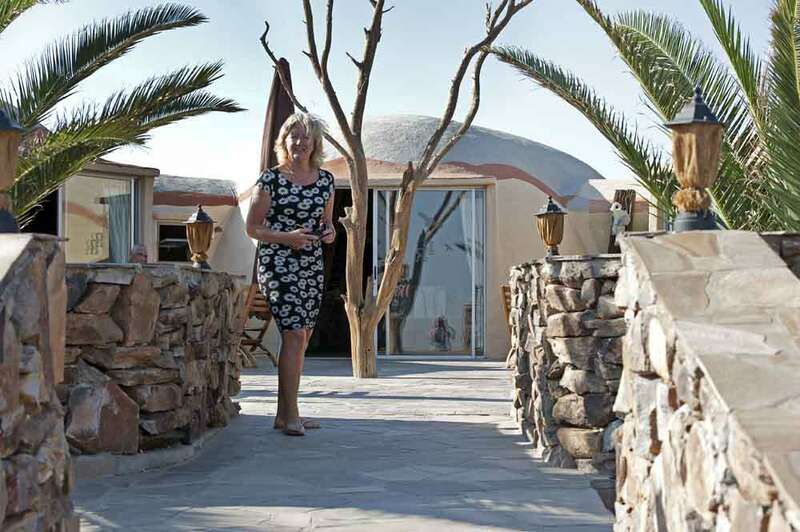 Greeted by Innes, Wolfgang’s wife with sparkling eyes, she showed us through this rock edifice to our individual igloo (modelled on the traditional hemispherical shaped mud huts of the bush people), one of sixteen fully equipped rooms and suites. We were immediately impressed by the standard of finish and appointment of the igloos with no attention to detail missed and everything perfectly in place. The clever layout and beautifully finished bathrooms finally dispel any notion that you are in a cave! The views from our igloo were both vast and impressive. 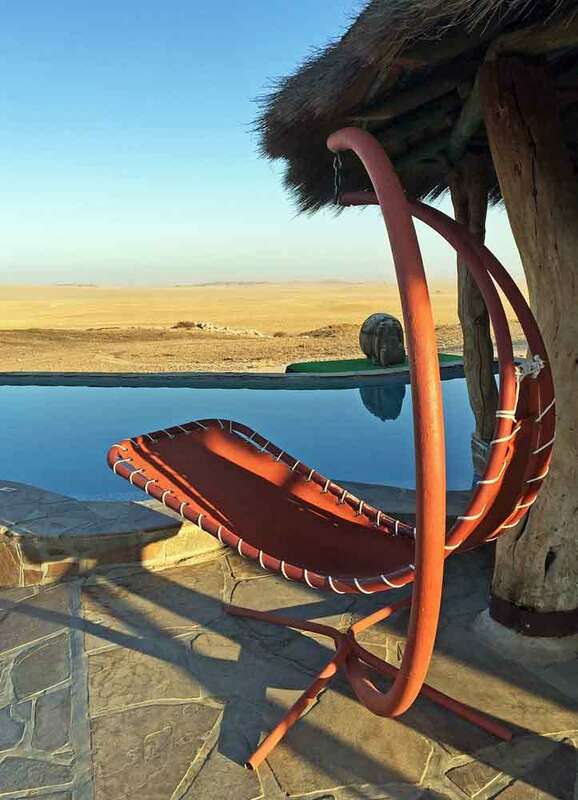 Situated on its own 12,000 hectare property, Rostock Ritz does offer sundowner drives to view the wildlife and to sip a gin but we elected to use the pool and simply view grazing Zebra in the distance before changing and heading for the main lodge for dinner. Dining is a very pleasant experience with a highly competent chef ready to prepare simply lovely meals from the a la carte or day’s menus. The Ritz’s staff are notable for their attention and friendliness, giving the impression that they are here for you individually – a very caring approach. Other distractions, such as rock art paintings and 4×4 drives, are available but as we were en route to the Gaub Pass and canyon we were more than happy just to enjoy the splendid isolation that Rostock Ritz affords. Our only criticism remains that of the Ritz’s appearance from a distance as it wrong foots you for what to expect subsequently – but as you’re unlikely to find an alternative in the middle of nowhere you’re fortunately assured of everything being just right as soon as you book in. If anyone had told us if we’d like an endless view of sand in front of our bedroom we might have questioned their judgement, had it not been for staying at Desert Breeze. Having just left the Namib Desert behind after days travelling through it, the sea fog of Walvis Bay and Swakopmund was briefly welcome. 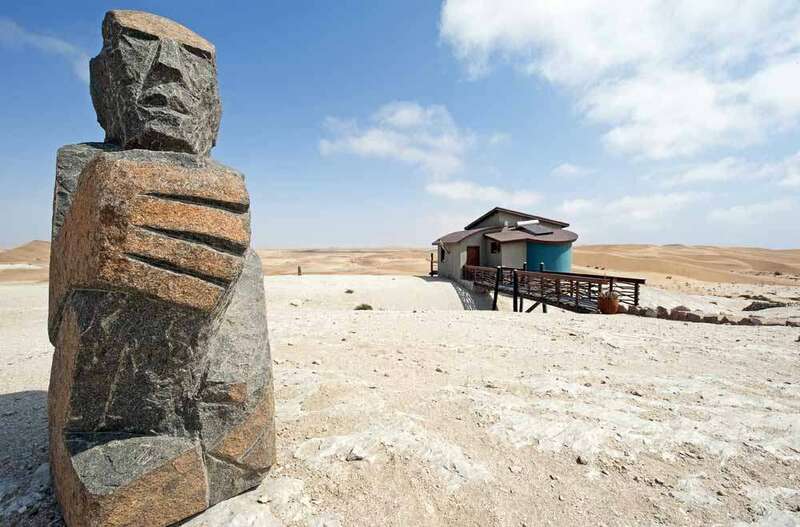 Having threaded our way through the bland and rapidly developing building site that is expanding Swakopmund we were not expecting the refreshing sight of Desert Breeze perched on the very edge of the Namib. 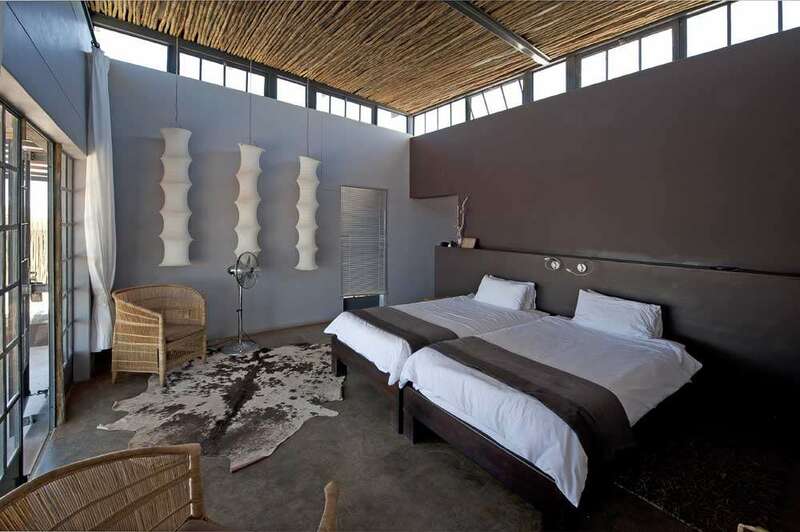 When much of tourist Africa mimics the traditional bush lodge of wood and adobe construction, Desert Breeze embraces a major departure into bold angular, modern, primary colour-washed walls enclosing spaces where straight lines and curves come together in perfect harmony. 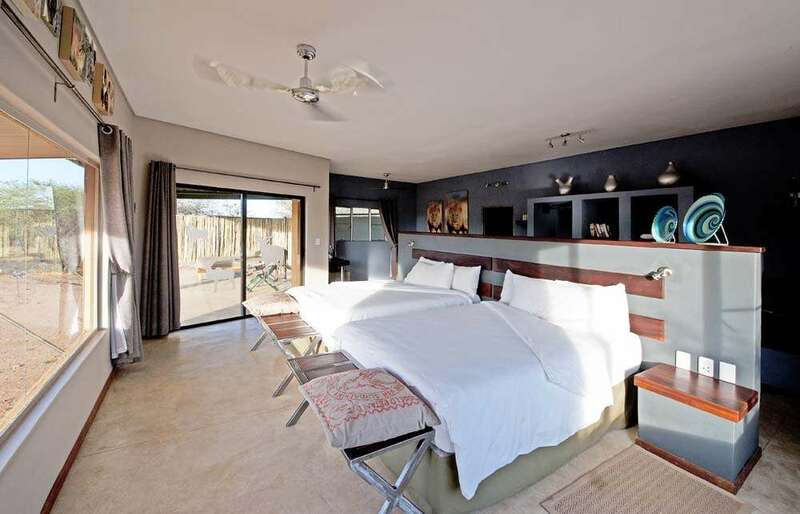 Desert Breeze has been constructed with a love of art on a grand scale and each of the twelve individual luxury bungalows with innovative en suite facilities and split level accommodation is fronted by a broad deck that captures the ever changing colours and shadows of the sea of sand in front. Each bungalow is itself cleverly placed within a rocky site amidst massive stone forms and smaller basalt sculptures so that the minimum of overlap occurs to obscure views to the front. 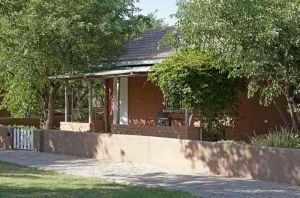 Even the lengthy weaving and undulating boundary wall behind the property reflects a deliberate initiative to pay attention to every aspect. 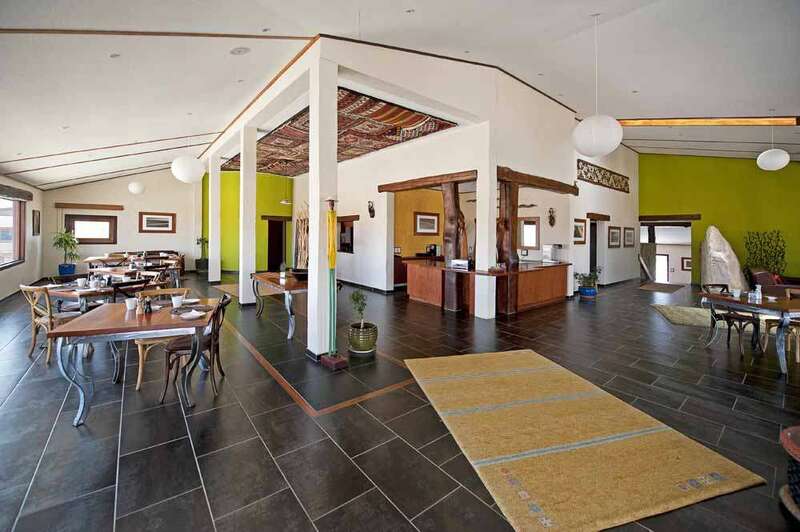 The central reception and dining area reflects the same style and is marked again by attention to detail with its stylish stainless steel table legs and curved wooden veranda rails. German design thoroughness and efficiency prevails throughout (although we don’t believe it’s German owned) and it’s a shame that Desert Breeze doesn’t currently offer dinner, especially as their breakfast is extensive and satisfying. Swakopmund is one of the few main towns that you’ll encounter in any Namibia tour so perhaps the opportunity to eat out is one that most travellers prefer to take. 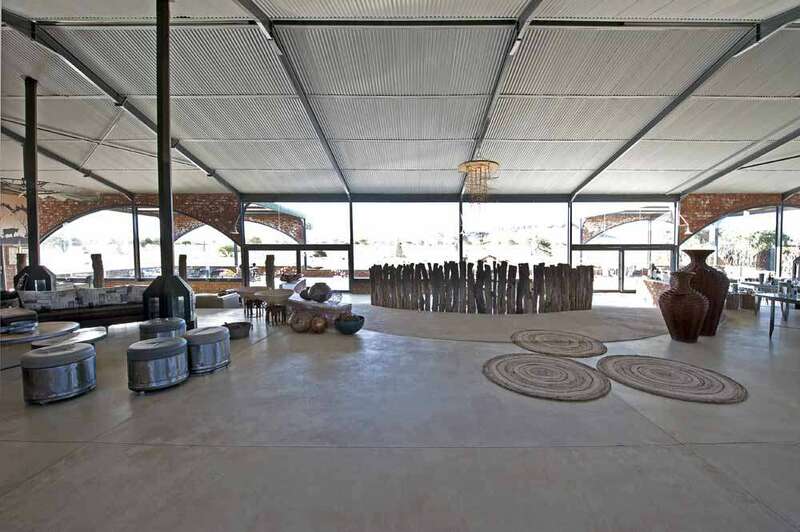 Chosen initially for its location between the rock engravings of Twyfelfontein, the Petrified Forest and the Himba people’s village of Otjikandero we weren’t necessarily expecting great things as a couple of other choices were already full. 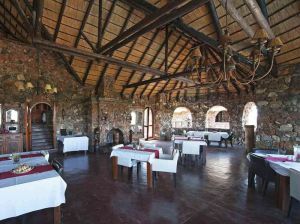 Built in the wattle and daub style under Mopane trees and connected by a labyrinth of paths, the main building and chalets of the lodge look like an African village. Unusually, each of the 60 double-room chalets with air conditioning sits in its own vegetable and herb garden surrounded by a low wall, giving one the sense that you have ‘moved in’ and are very much part of a small community. 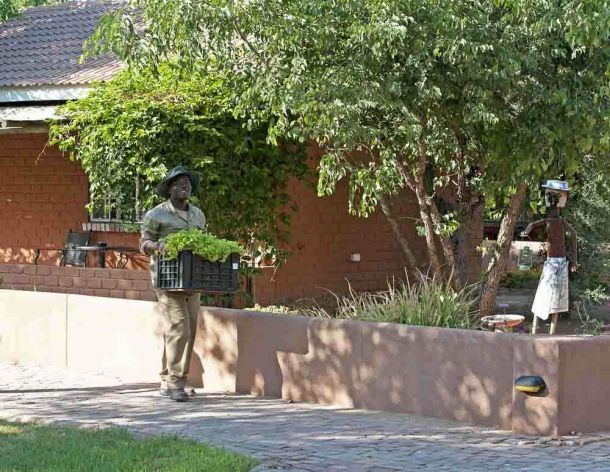 Each of the gardens is tended daily and supply fresh ingredients for the tasty buffet supper. 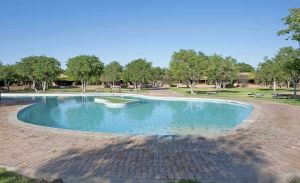 There is a large swimming pool for chilling out and a viewing point for relishing sunsets. Such a shame therefore that the rooms themselves, whilst being fully functional and adequate, give the impression of having been modelled on third world government offices. With plain magnolia walls, Crittall windows and minimal plywood furnishings they are Spartan to say the least with fixtures and fittings that are barely adequate – but when all is said and done, you will spend more time in the communal areas that are smartly finished, or swimming or eating; all of which can’t be faulted and ultimately justifies us including Damara Mopane in our list. Even though the Lodge is frequented by coach parties, you can distance yourself sufficiently from them to make your own experience an individual one. 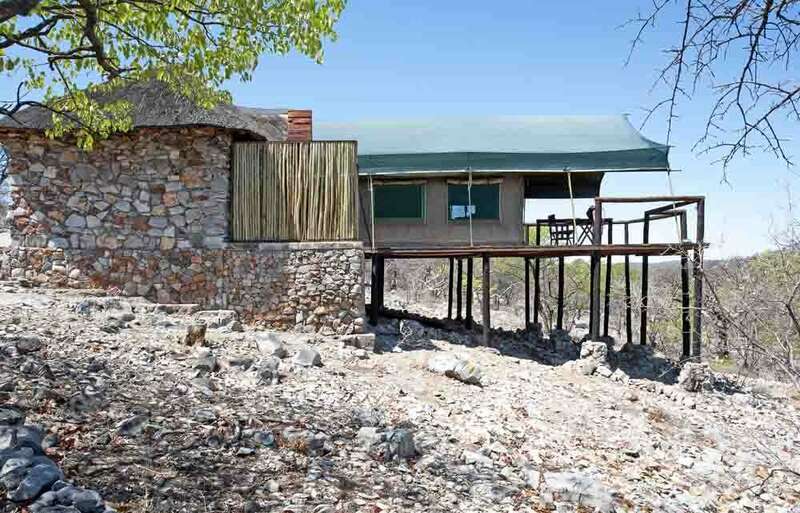 To say Eagle Tented Lodge is at Etosha National Park is like a budget airline saying they fly to a city and then depositing you fifty miles away. That said, the eighty km drive to Anderson Gate on the south side of Etosha is probably easier over the barren empty spaces than is the commute into your favourite city. Set in its own private game reserve along with Epacha Lodge, Eagle Tented Lodge offers a small collection of eight standard and eight luxury tents, each with its own private raised wooden balcony, with a splash pool or outside bath. 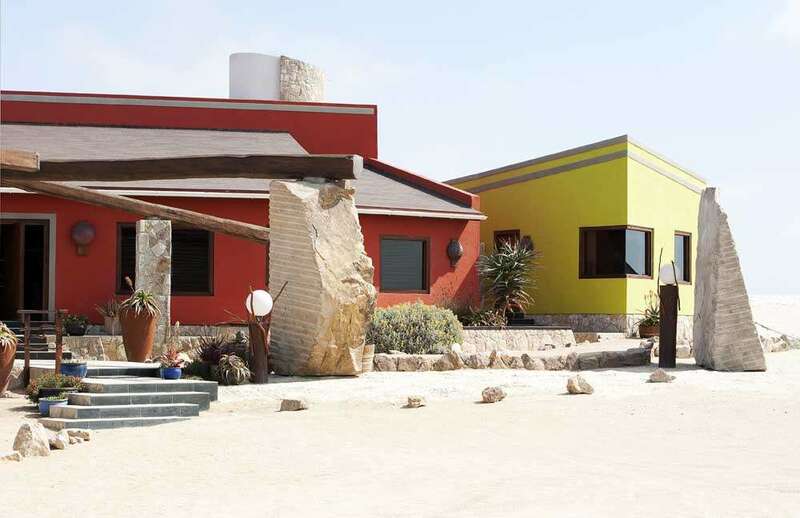 Each stone-built bathroom has a spacious indoor and external shower, toilet and a washbasin. The significant thatched lodge itself, built from local rock and somewhat like a small Bavarian castle, has two restaurants, main bar, pool bar, swimming pool and a fully equipped ‘Mystique Spa’ with aroma and mud baths, hydro therapies, pedicures, manicures, massages, yoga and Thelaso therapy. 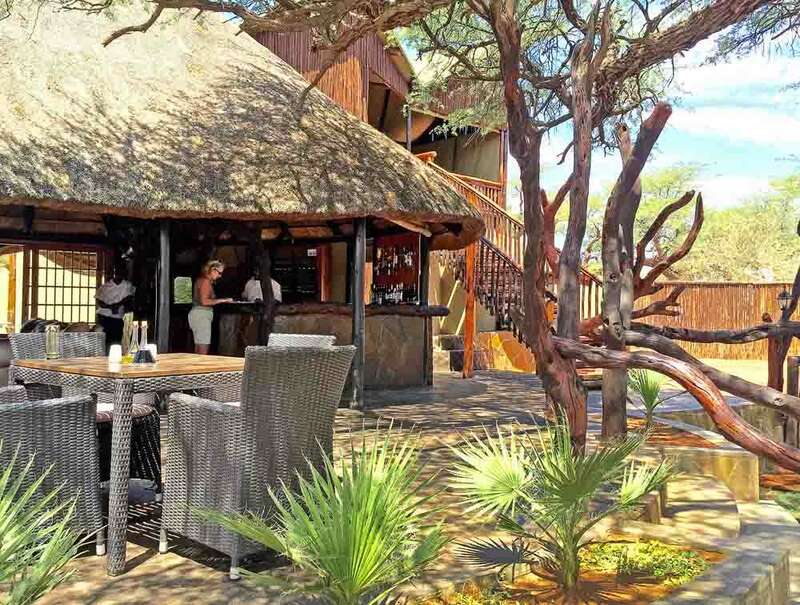 Whilst the travel time to Etosha must be factored in, especially if your passage through Etosha is time limited, Eagle Tented Lodge & Spa does offer a haven of calm, well off the beaten track and we certainly couldn’t fault any aspect of the accommodation, cuisine or service. If we had to nit-pick we’d question the validity of the game drive and the knowledge of our guide but as we were anticipating a full day or so in Etosha this was of little consequence. 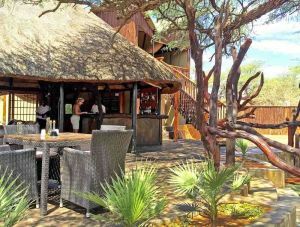 As with all of our choices, Eagle Tented Lodge is a unique Lodge in a unique location and can be enjoyed in a stand-alone capacity and as part of a richly varied set of accommodation choices throughout Namibia. 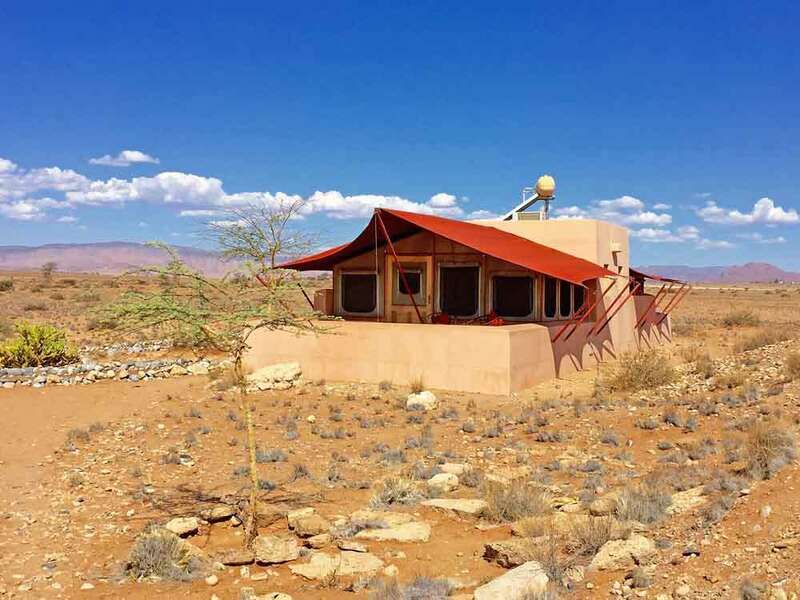 Mushara Bush Camp is one of three camps and two villas under the same ownership and of varying layout, format and style. 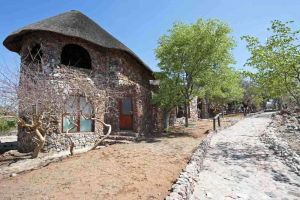 All are within ten kilometres of Etosha’s Lindequist Gate in the east of the park and it’s a matter of personal preference or number in your party as to which you might choose. 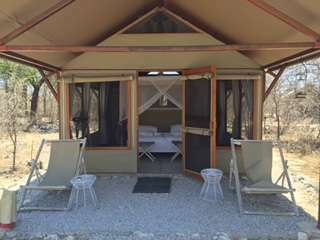 We stayed in Mushara Bush Camp which has sixteen en suite tents set sufficiently apart from one another to retain privacy. 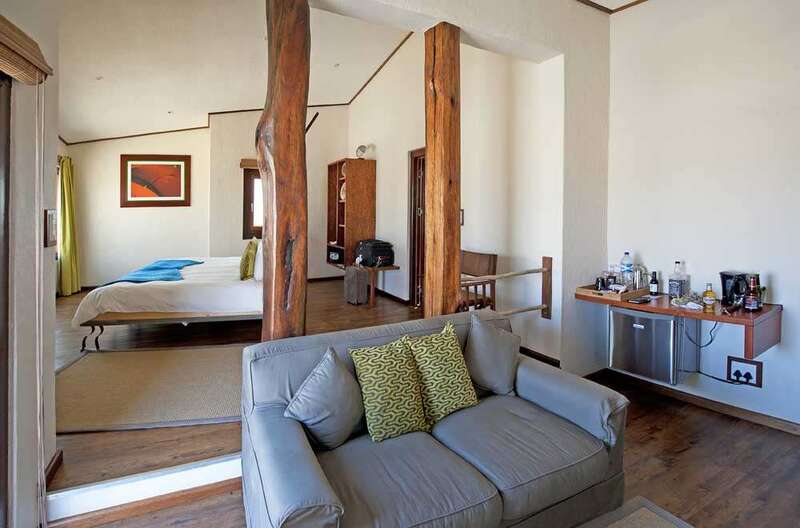 Each has its own veranda, full mosquito netted beds and pleasant ambiance – although we’d fall short of calling them luxury they nevertheless grew on us during our stay. 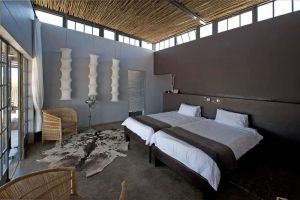 Mushara themselves call the Bush Camp ‘down to earth’ but the overall impression is one of friendliness and efficiency. 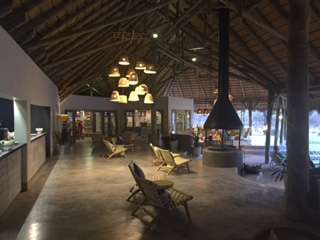 Dining alternates each evening between the large thatched Bush Camp House, an open sided but covered communal area that also encloses the bar, reception, washrooms and shop and al fresco around the barbecue area near the swimming pool. The overall impression is one of a clean smart modern facility with a traditional feel enhanced by interesting artworks and stylish design. Small items, such as the linen handtowels in the washrooms add to the impression of attention to detail. 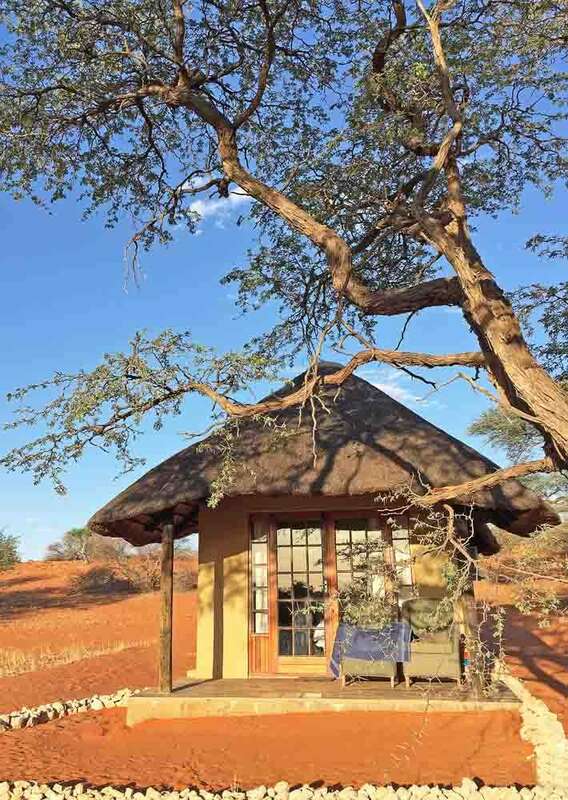 We enjoyed our stay at Mushara and would feel happy and confident to recommend any of their lodges based on the care taken at Bush Camp. 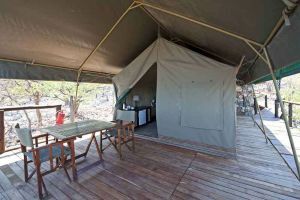 Whilst many of the lodges around Namibia allude to a proximity to wildlife, Mushara came closest for us with a male lion roaring not far from our tent for over an hour on one night. 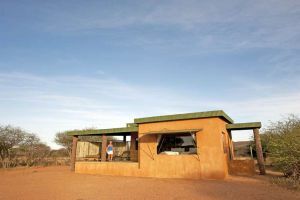 We’d arranged a stay at Okonjima as we were determined to see Cheetah. As it happened we’d been lucky enough to see a mother and cubs in Etosha but the visit to Okonjima was also an opportunity to compare the work of the Cheetah Conservation Fund at Otjiwarongo and Africat Foundation at Okonjima (more of that in another post). 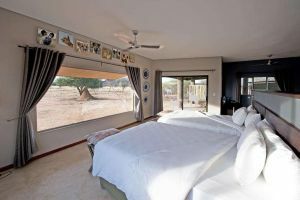 Suffice to say that Okonjima Nature Reserve is the home of Africat but four lodges share the reserve as well. Whilst they indirectly contribute to Africat they are nevertheless stand-alone tourist lodges in their own right – Okonjima Plains Camp, Okonjima Bush Camp, Bush Suite and The Villa. 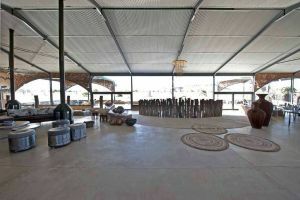 Originally a huge farm, Okonjima Plains Camp owes much of its main reception/dining area architecture to an agricultural ‘shed’. 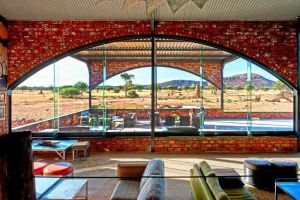 That said, it’s impressive and remarkably innovative in the way that it utilises the simple structure to best effect with a stunning curtain wall of glass along the whole of one side that beautifully frames the bush scenery and grazing wildlife outside. Individual and semi-detached ‘View’ bungalows offer a similarly superb outlook from the blockhouse buildings that again seem to have little empathy with their surroundings but are eminently comfortable and stylish with every attention to detail inside. Dining is a very pleasurable experience, for breakfast, lunch, tea and dinner; with dinner being a set menu. Our breakfast omelettes have to be the biggest and most well stocked omelettes we’ve ever eaten! 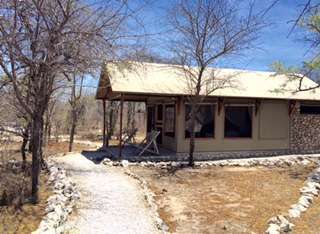 The Bush Camp is a more traditionally built wood and adobe construction with separate sleeping and lounge rooms for each individual lodge. 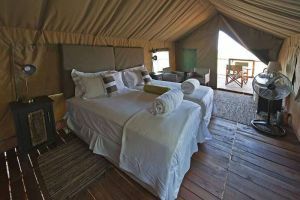 We feel that choice between the two is simply down to taste in style and décor as although its only full board at Bush Camp there is parity in price with Plains Camp if taken on the same basis. 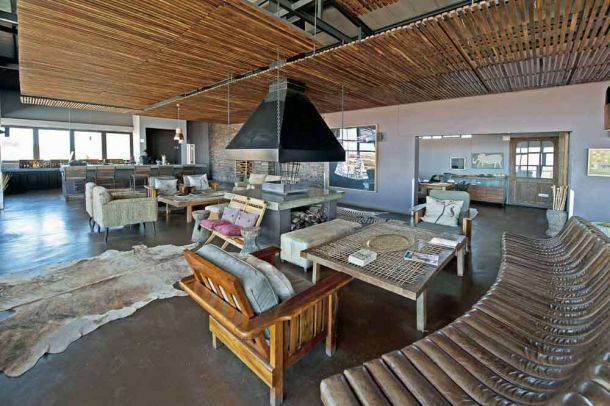 Bush Suite and The Villa are more exclusive individual accommodation for small parties or families. The estate of some 20,000 hectares measuring approximately 20kms by 24kms is large enough to allow predators to run wild and their prey base to have a fighting chance of survival. Whilst it might be tempting to call Okonjima a large zoo it’s only because of initiatives like this that protected areas are extended for wild animals, enabling African wildlife to continue to thrive rather than being squeezed into ever smaller zones – as is the case in India. Several animals are radio collared, which not only enables careful monitoring of the animals but also facilitates tracking. Whilst a number of our trips on private estates were less than rewarding, our forays to see Cheetah and Leopard at Okonjima were only successful because of this ; as the animals range freely over vast distances (up to 2000kms for a Cheetah, which makes finding them difficult). 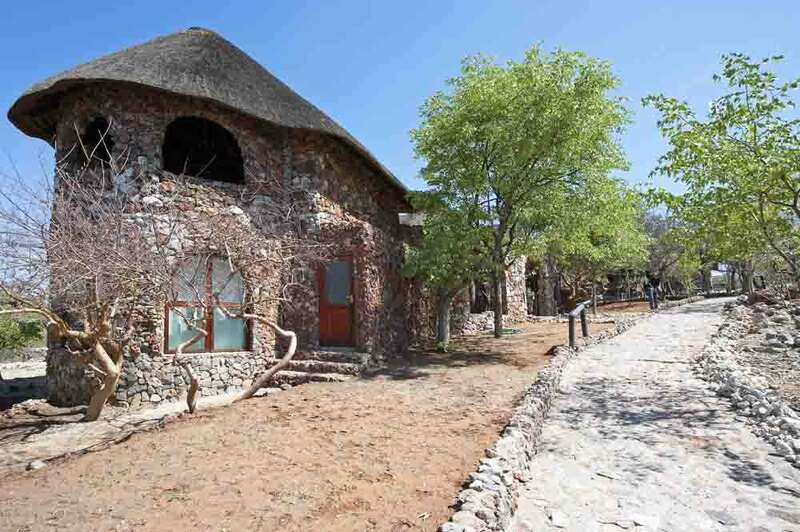 The reserve is well stocked with wildlife, much of which remains from the days when this estate was a farm. 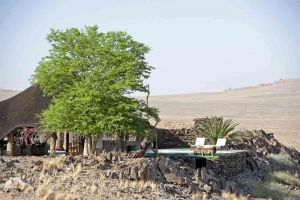 The guides, especially Gideon the head guide, were very knowledgeable and our final stay in Namibia made all the more pleasant by the jocular approach of the staff and an overall willingness to please. 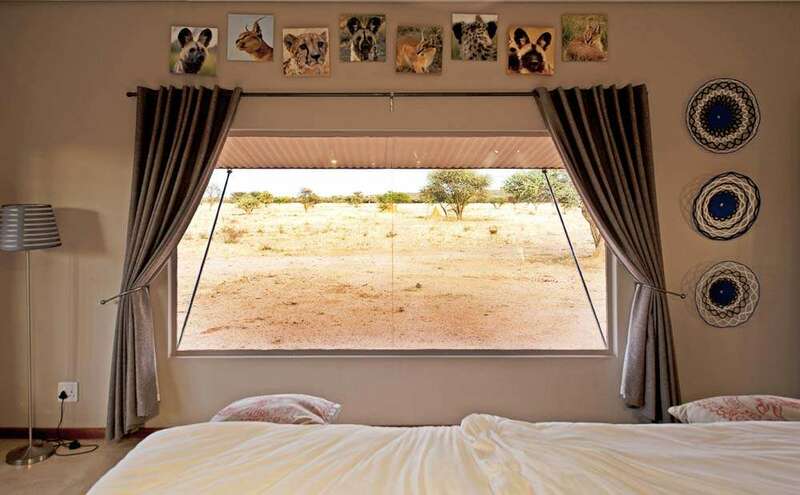 There’s something very special about waking up as the dawn breaks, looking out onto the African bush through a huge picture window that makes you feel as though you’re part off the landscape. So there you have it! Our choices are not necessarily the most luxurious but they do offer a fascinating cross section of interesting and comfortable accommodation throughout this much varied country. 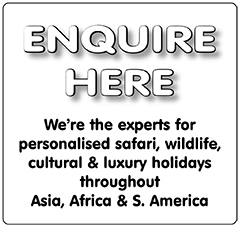 You could do far worse than follow our guide and you’ll certainly enjoy yourself as each is situated in some of the most incredible scenery and locations you’ll find anywhere. 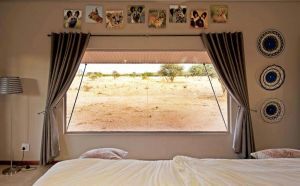 Let us plan your own fantastic trip to Namibia and Africa! 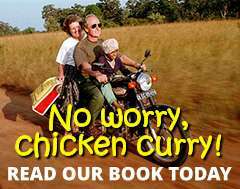 Why not download our guide brochure or give us a call today on 01202 030443, or simply click ‘enquire’ to tell us where you’d love to go?